Former President of USA Basketball Tom Jernstedt (left) was recently brought on to be a special advisor for Big East basketball. This year saw a scramble in Providence, R.I. – the former home of the old Big East conference – and in New York City, the new home for the newly reconstituted Big East. After years of hand-wringing and existential questions about what had long been America’s top basketball conference, in March the so-called Catholic Seven, seven basketball-focused private schools from the old Big East, formalized the new conference with the addition of three more schools of similar character: Creighton, Xavier and Butler. For a moment, Big East fans could take a breath: Their beloved conference was saved, albeit in a slightly different form. But there were no breaths to be taken in Big East conference offices. First of all, they didn’t even have an official office. That’s part of starting a new conference. Nor did they have any employees. And a new school year – a new athletic season – was just around the corner. So the Big East made its first hire, a director of basketball officiating. Then over the summer it made a splash hire for commissioner in Val Ackerman. She’d worked under David Stern in the NBA, been the original commissioner of the WNBA, and served in powerful roles in the international basketball community. In the fall, as the conference readied for its first basketball season in a new form, the Big East announced another big-name hire that resonated in basketball circles: Tom Jernstedt. Haven’t heard of him? He might be one of the key administrators in recent college sports memory. Not the type of guy who hogs the spotlight, but the type of guy who gets stuff done. Jernstedt worked for the NCAA for 38 years, serving as director of events for the organization and was the man who guided the NCAA men’s basketball tournament into becoming one of the most successful sporting events in America. He was named to the National Collegiate Basketball Hall of Fame in 2010, when he retired from the NCAA. Ackerman hired the experienced Jernstedt as a special advisor, drawing on his decades of experience with the NCAA tournament to help return the reconstituted Big East to its roots as America’s top basketball conference. As the reinvented conference enters conference play later this month, I recently spoke with Jernstedt about his vision for the new Big East. Q: What does this new job mean as special advisor to the commissioner? A: That means whatever the commissioner wants me to do. Val and I have been very good friends for several decades through our involvement with USA Basketball. I was there for 30-plus years representing the NCAA, and she was there for the NBA and the WNBA. 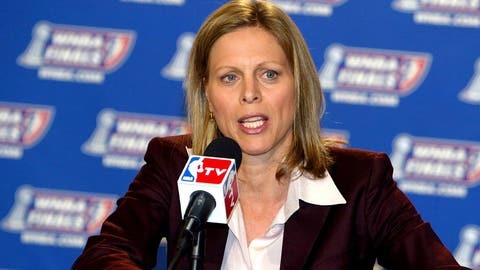 Former WNBA President Val Ackerman became Big East commissioner in June. We go way, way back. I’ve always had tremendous respect for Val as a person, as a leader, as a professional. She’s a very talented individual. Most people are not familiar with her basketball background. She went to Virginia as an undergraduate, and she and another woman split the first basketball scholarship for women’s basketball at UVA. She went to UCLA law, then she joined David Stern’s staff at the NBA as a legal advisor. David moved her around in a variety of positions, then appointed her the first commissioner of the WNBA. She’s a tremendous professional who knows the game so well. The USA has one representative on FIBA, the international body that controls basketball, and Val is that representative. She has tremendous respect internationally and domestically as a basketball person. When she called and wanted to know if I was willing to help her, I was surprised. We talk fairly often. I gave it some thought. Val and I both knew Dave Gavitt (who founded the original Big East) very well. Dave Gavitt was one of the most talented administrators and coaches and gentlemen I’ve ever known. So this emotionally pulled at me when Val made the call. The first thing I thought about was Dave. This is a new chapter for the Big East. It’s in its 35th year, not a new conference. It’s a new alignment but it can draw on heritage. The core is still there, plus some exciting new institutions. It’s back to its heritage. The conference has great potential, all committed and focused on basketball. Q: Dave Gavitt is obviously a college basketball legend. What is it about him that helped make the Big East so special, and how is Val Ackerman similar? A: They both have this intense commitment to the game of basketball. Both played the game as youngsters on through college. They love the game. Val was going to practice law and all of a sudden ends up with David Stern at the NBA, then the WNBA. Both are so creative and committed to the game. 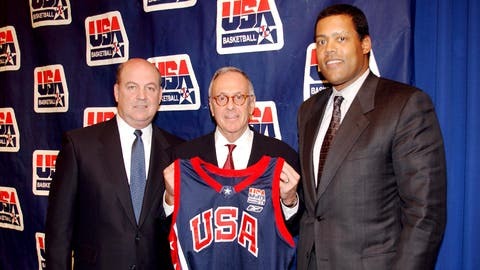 Dave was one of the early leaders for USA Basketball. He set the pace. Just a visionary, so bright, and just had a wonderful way with people. Val has some of those same characteristics. One of the characteristics of Dave Gavitt, when you’re talking to Dave Gavitt you may be in a room or a reception, but he was looking at you in your eyes, not looking over your shoulder to see who was walking in the room. That’s a little thing, but that’s the guy he was. Q: Is Val’s task of creating a new Big East in this day and age more challenging than Dave’s task was? A: I don’t think so. When it first started, that was a new challenge: a new conference bringing those institutions together. At first (when Val hired me) I was referring to it as the new Big East, but now I think of it as a new era, a new chapter. All these traditional schools are involved plus Creighton and Butler and Xavier. One of the greatest storylines in my 38 years at the NCAA, one of the most exciting championships I’ve been involved in was my last one in 2010, Butler versus Duke. To me that was a shining example that characterized what the NCAA tournament is all about: the David-and-Goliath storylines. You have Mike Krzyzewski, one of the finest coaches of all time, and at the other end of the bench, Brad Stevens and Butler, 31 years old, playing Duke. That’s what helped build this tournament to what it is today. And that’s part of the story of this Big East. The challenge is there for the Big East, but she’s starting with people that were in the Big East in the beginning. It’s a new era, a new chapter, and it’s very, very exciting. They’re focused on basketball. They’re not concerned with the other stuff. Conference realignment has settled down, and they’ve made a commitment to this sport. New members Creighton, Xavier and Butler will play a crucial role in the future of the conference. Q: What’s your big-picture vision for the Big East? A: It’s back to its heritage. The Big East has had a great reputation. It’s been in Madison Square Garden for decades. From Villanova to Georgetown to Providence, the majority of the basketball community across the country would have declared it the strongest basketball conference in the country. That’s where they want to go back to. Q: How does what you learned supervising the NCAA tournament tell you about what to do at the Big East? A: It’s a people world in which we live. Getting to know all these people personally and professionally is one of the highlights of my career. When I look at the Big East, they have a lot of those same people. They’ve made the commitment. When you have good people, you accomplish a lot. Q: The old Big East had a very specific basketball identity: rough-and-tumble, a big-boy conference. This conference doesn’t have an identity yet. How do you see the new conference’s identity developing? A: It does have the benefit of being the Big East. I don’t think they’re starting from scratch. They’re drawing on tradition. It’s a new alignment, but the majority of the institutions are from the original Big East. Q: Do you expect the Big East’s more physical style of basketball to continue, even with the new fouling rules this season? A: Everyone is adjusting. It appears to me the adjustment to the new rules has been smoother than I anticipated. Everyone is adjusting. It’s going to make the game better. Q: How important is the expansion of the conference? Is it vital to expand, or is it more just if it comes it comes? A: In my mind it’s the latter. … We are where we are, and couldn’t be happier. Q: Ten years from now, what will be considered a success for the newly reconstituted Big East? A: I would be surprised if they don’t have a number — and I won’t give you a specific number – but a number of teams in the NCAA tournament on a regular basis and succeeding on a regular basis. And just continuing the heritage it’s had and established over the past three decades. Q: Keeping the Big East name must have been key. A: That was a great stroke, very exciting and beneficial. It’s a brand that’s very meaningful in basketball. Everyone knows the Big East. Q: How challenging has it been helping start a new conference? A: The challenges (Val) has had in her career, I don’t recall in my many years in this profession — I don’t remember a commissioner have a bigger challenge than Val had (with the WNBA). Now it’s been things like finding office space. … It’s a tremendous challenge. The Big East is fortunate to have somebody of such a multi-talented background. Q: How important or symbolic is it that Val is the first woman to lead a major college conference? A: I think to be able to hire somebody with this individual’s remarkable background is the most important thing for the Big East, whether it’s a female or male. She has such an impressive background. You can point at the FIBA connection, that she’s an international leader in the sport, and no other conference has that. The Big East is so fortunate to hire this individual. She just happens to be female.